What is Your Best Option for a True Content-First CMS Platform? NP GroupBlogTechnologyWhat is Your Best Option for a True Content-First CMS Platform? One would think that if a piece of software is labeled as a “content management system,” the focus of the system would always be the actual content. After all, if CMS systems didn’t do a spectacular job with the creation and management of content, could they really be called content management systems? Sadly, this is not the direction the CMS industry has taken over recent years. Most open-source and closed-source enterprise CMS platforms are really not “content” management systems at all, but rather web experience management systems. While most of these platforms originated with a particular mission in mind (for example, WordPress was a blogging engine), over time, they have shifted in an attempt to be all things to all people. By undertaking this challenge, they slowly began to diverge from being truly focused on “content management” and they instead became systems tailored to presenting information in one medium: the Web. Because of that, they only focused on how to present content via layouts or templates. If you are familiar with many of today’s CMS platforms, you know that you are limited to creating content around what the design or site layout allows—not what you may necessarily be trying to accomplish in the first place! Now, we all know what problems that has ushered in. Bloated software platforms, lack of customization and flexibility, and the inordinate amount of “hacking” that must occur to make those systems meet your needs. Constant security vulnerabilities, endless software updates, and unpredictable upgrade cycles have plagued the CMS industry that promises to provide scalable, flexible, and secure content management solutions. My friends, the industry has lost its way. 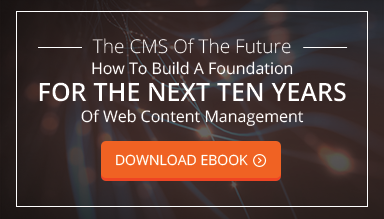 We’ve already spoken heavily on our blog, in webinars, and even in one of our e-books about our perspective on the CMS of the future. We believe that a content-first strategy combined with decoupled or headless technology is the wave of the future. It allows for management of content in an environment that provides for multiple methods of distribution and display. But that doesn’t really fool anyone. The architecture is still the same as it was 10 years ago. The idea of content-first CMS systems has been talked about at length across the industry. Of course, most CMS developers claim they are taking that approach with their systems. But how can that be? How can a CMS software provider claim that their system is specifically created for your content? That cannot ever be assured. Isn’t it presumptuous to say that they know what your content is, how you create it, and how you distribute it? Therein lies the problem. For a CMS to be truly content-first, it must be built with your content as the centerpiece from day one. With that in mind, the best option for building a content-first CMS is to custom build your CMS portal. There simply isn’t any better way. Custom-built CMS platforms combined with a content-first strategy are like wine and cheese, which my college Italian professor would describe as “making love in your stomach” (yes, I went there in a technical blog post!). But to understand why this approach makes the most sense, you have to gain a realistic understanding of what content-first really means. The best method is by digging into an actual, real-world scenario. So let’s break down this website that you are on right now. For all intents and purposes, our website is informational. Many CMS platforms can power an informational site. However, our administrative workflows are absurdly simple. Our website is broken down into sections, as you can tell by browsing around the site. We have simple content areas such as “About Us” and other similar text-based pages. There isn’t anything overly remarkable about something like that. However, we do have other areas where a content-first strategy made a lot of sense. Our portfolio isn’t just a set of pages. It’s a complex relationship of clients to projects, all stored in bespoke database tables. Each project is categorized, and each contains its own media. The relationship between projects, clients, and categories allows us to manipulate and present the data in many different ways—both publically and for internal use. Furthermore, we have videos, webinars, and our service offerings. Each of these is controlled in our admin portal by their own distinct tool. And each of those content definitions can be utilized in any number of other applications. For example, we can integrate client lists to third-party tools or automate the publishing of portfolio pieces to social media. Finally, we can share videos from our system to multiple distribution channels. Each of our content areas is built with the understanding that the Web is one place that content is displayed, but it may also appear elsewhere down the line. This summarizes what a content-first strategy is: developing CMS solutions that build around content, not building content around a CMS. And in retrospect, we’ve actually been taking this approach with customized CMS solutions since 2001. You see, before off-the-shelf software made everyone think the same, actual developers used common sense. They looked at a website architecture, created a list of unique content areas, and assembled management tools for each particular piece of content. Then tools like WordPress came around. And as more and more were created, developers shifted focus. It wasn’t to their favor to focus on content and build custom tools anymore. It was to their advantage, however, to mold existing systems into a shape that matched their client requirements, even if they weren’t a perfect match—and that led to more and more customer dissatisfaction. In fact, the number one reason we hear from potential customers for a CMS change is lack of satisfaction. I wonder why? Custom CMS development is an art. It requires a different perspective. If you are considering a content-first strategy, then make sure you have the right partners in the room. Many developers today will interpret your requirements within the constraints of the systems they know, but you can never be sure if they are actually listening to what you are saying. In many cases, they are just translating your requirements into available off-the-shelf tools, plugins, and extensions. We all know the term “lost in translation”—it applies to technical projects as well. Hence, this new realm of dissatisfaction in a client/vendor relationship. At this point, you are probably thinking that I’m taking this position because custom CMS development is our specialty. To an extent, yes, I wouldn’t be writing about this if I was focused 100% on WordPress development. With that said, I have said in the past and will continue to profess that WordPress has its place in the CMS world. If you are making an informational website for a small business or some other limited scenario, displaying content only on the Web, not as concerned about enterprise security, then WordPress or Joomla or Drupal are great solutions. However, if you are a sophisticated enterprise and you are determined to focus your next CMS installation around a content-first strategy, you should give the development of a custom CMS a serious round of consideration. Your content—also known as your most important digital asset—should not be taken for granted or commoditized into some platform that doesn’t realize it’s importance.